Oof…yesterday was a tough one. We got on the road at around 5 am to beat the heat and watch the spectacular sunrise over the rock formations. The night before, it probably only got down to like 75 degrees. We had an awesome ride in the (relatively) cool morning air, a great second breakfast 15 miles in (they make a killer breakfast burrito in Cliff Dwellers, AZ), and discovered that the little tunnels under the road for washes make great spots to take a cool break. But we were pretty much climbing the whole day. The first 2000 feet were fine. The next thousand was didn’t seem bad because of the amazing views from the switchbacks. it was really the last two thousand ferry of climbing that did us in. that’s right, we went from 3100 feet to 7900 yesterday. It took us about 12 hours. Thankfully, the air got cooler as we climbed, transitioning from barren rock, to spotty cactus, to scrubs, to juniper pine, and ending in a ponderosa pine forest. Also thankfully, there is a resort lodge restaurant across the street from the campground. Overall, a beautiful day of riding, but pretty challenging. Today, we head back down the hill and into Utah! We’ve made it into Utah. It’s been a great couple of days. We had an great lunch in Kanab – if you’re ever there, I recommend The Mediterranean Table. We had an awesome ride out of Kanab – uphill in twilight, downhill by the full moon. Riding into Zion was absolutely amazing – beautiful rock formations, canyons, etc. 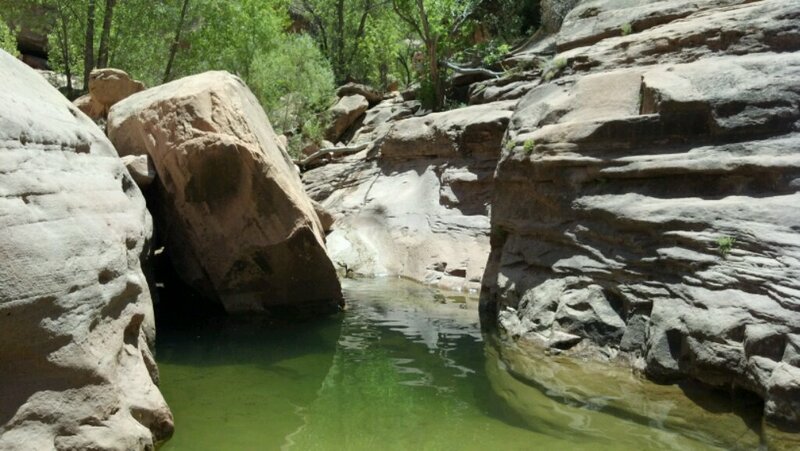 Big thanks to J. Sperry for tipping us to the world’s best swimming hole – just the thing we needed when it was 101 degrees. We met up with our French friend, Frank, again. We did an awesome hike in Zion canyon, hiking in the river where the canyon narrows to about 20 feet in some parts. The photos will not do it justice. Got another early morning start. It’s back down to the mid sixties, and we’ve transitioned to yet another landscape – forested mountainsides with lush meadows. We’ll be in Bryce canyon tonight. We’re still having a great time riding through spectacularly beautiful country. Bryce canyon was gorgeous – it got down to the mid thirties last night. I’m having some minor issues with the zipper on my tent, but other than that, we are living the dream. Rai Sue is worried about her drivetrain, but luckily there’s an 8 am bike shop. We’re on schedule to get Rai Sue to her plane in Cortez, but not without some help. Our plans to ride the Burr trail were thwarted when we found out that the dirt portion was now all sand due to a dry winter. The detour through Grand Escalante added about 70 miles and a big climb. Luckily, we managed to get a couple of rides from some very kind people. The first ride involved stuffing four people, two bikes, all our great, and the angry chihuahuas into an old ford explorer. For the second ride, we put our bikes and gear into the boat they were hauling. The riding has continued to be amazing – every hill we go over brings us to a different landscape. We just finished the last big climb before I trade Rai Sue in for Nick and Jeff. Author gregPosted on June 11, 2012 Monticello, Utah1 Comment on Detour! nick and jeff’s first long day. started in cortez, ended at telluride’s only brew pub. Rooted against miami…close, but not enough. Sleepy time. Author gregPosted on June 16, 2012 Telluride, COLeave a comment on nick and jeff’s first long day. early lunch before a big climb. Author gregPosted on June 16, 2012 Montrose, COLeave a comment on early lunch before a big climb. Took a break in montrose, CO, heading over to gunnison, not sure if we’ll make it today. Hot sun, dry air, gorgeous scenery, great edibles, invigorating excercise.